Questa lussuosa villa (420 m2) c. due ettari ai margini del bosco con giardini è a soli dieci minuti da Cannes. Anche se meno di tre chilometri dalle spiagge, la villa offre un alto grado di privacy insolito per la zona. La villa gode di una vista panoramica che comprende il mare e Cap d'Antibes. La terrazza ovest con vista sulla piscina ospita 12 o più commensali con barbecue. I vasti giardini sono ben tenute dal giardiniere che risiede presso il lodge cancello. La villa si trova a pochi passi da un gran numero di servizi tra il mare, le spiagge, golf, equitazione, porti turistici, ecc, ed è a soli 20 minuti dall'aeroporto di Nizza. Ci sono numerosi luoghi in tutta la scomparsa ampie e ben maturate parco della villa. Anche la villa dispone di non meno di quattro aree barbecue separate, ognuna con i propri vista unica. La camera da letto principale (matrimoniale) con terrazza privata ha due bagni interni, uno con vasca e WC l'altro privato con doccia separata e wc. Questa camera è dotata di aria condizionata. Due camere da letto matrimoniali più A / C sono dotate di bagno privato bagni con WC. Un'altra camera da letto contiene due letti matrimoniali e dispone di bagno privato, mentre una camera doppia di condivisione un bagno completo e wc. Un ulteriore camera da letto è in uso come camera da letto per bambini adatto a quattro (modificabile) .C'è anche una grande sala giochi per i bambini al piano terra. La villa si trova a dieci minuti dal campo da golf di Cannes Country Club. Equitazione e tennis club nelle vicinanze. Imbarcazione a noleggio a Golfe Juan. La villa si trova a cinque minuti da due ingressi alla AutoRoute, 20 minuti dall'aeroporto di Nizza, internazionale, a pochi passi di Vallauris e il Museo Picasso. Eccellente ristoranti e negozi e luoghi di interesse culturale. Il lodge porta (ben lontano dalla villa) è occupato dal giardiniere che mantiene la vasta terra. Per esempio a 10 minuti di auto dalla villa si possono fare acquisti sulla splendida Rue d'Antibes Cannes, pranzare presso il porto di Antibes, prendere il sole torna alla villa nel pomeriggio e cenare in uno dei tanti ottimi ristoranti a Mougins. Monte Carlo, Nizza, Cap Ferrat, St. Paul de Vance, St. Raffaello e St. Tropez sono tutti solo brevi unità di auto. La villa dispone di due aree terrazza, due aree barbecue, doccia piscina e zona spogliatoio e un doppio garage. I bambini potranno usufruire di una casa sull'albero, scivolo e altalena, e una grande sala giochi all'interno della villa. We stayed here for 2 weeks in July for a family get-together coming from Dorset, Oxfordshire, Atlanta Georgia, Amsterdam and Casablanca; fifteen in all plus and an into everything toddler. We loved the Villa! It accommodated our very large family with ease. It seemed to have elastic walls swallowing us all up without a single hiccup. There are a myriad of places to find peace, both inside and in the sprawling grounds so no one trod on anyone else’s toes. The pool is fantastic with an infinity drop off in to Cap Juan! It was also very secure for the little one who never cracked the code of how to get in, although she had 30 eyeballs on her. We were able to all eat together outside on the Terrace/barbeque area , enjoying the fabulous pool with its stunning views of Cap. We were very happy here. Laurent and Antoine are a magical pair who saw to our every need. Antoine has a smile that could crack glass, and Laurent cooked for 17 of us (we had friends in from Biot) and didn't even allow us to lay the table. They are the jewels in the Villa’s very sparkly crown. Voila, you could say that this family is over the moon with everything about this magnificent Villa. Thank you again from the whole gang. Great views, barbecue and pool! Great house, with nice hosts and no problems at all. Three great double bedrooms with ac and a lot of more beds without ac. Really stunning views and fantastic pool with room for about 7 sunbeds. Standard of the house was overall good, and well maintained garden. 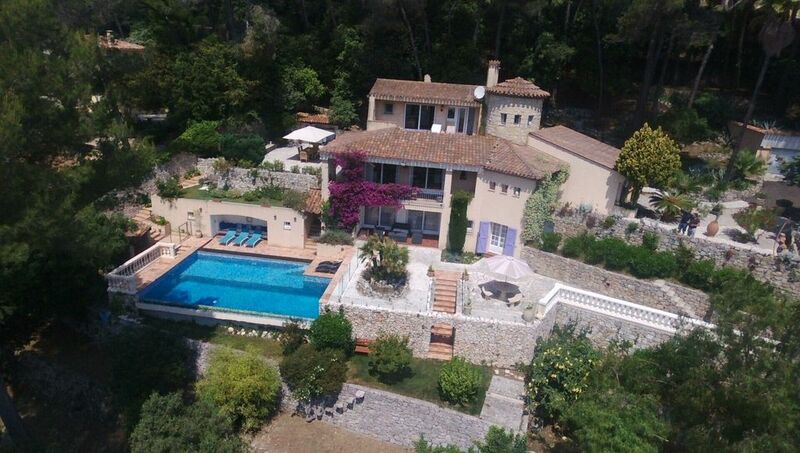 Wonderfully located on a hill top overlooking the bay of Cap D'antibes and surrounded by pine trees...within 10 minutes by car you can reach Juan-Les-Pins, Cap d'Antibes and Cannes. The infinity pool was amazing and very safe for your kids as it has two levels and surrounded by glass to prevent kids from entering and falling in it. I wish we had the option of downloading some photos on this site! What an amazing Villa to spend your holiday in. It is situated overlooking the Cap d'Antibes with spectacular views. Nothing has been overlooked in the attention to style, comfort, facilities and recreation at this luxury villa. We were a party of eight but the villa can comfortably sleep 12 adults or would be a very good location for a family holiday as the pool is magnificient and the grounds around the villa lend for a very private and relaxing time with a well equipped children's play area which includes a tree house. The interior is very comfortably furnished and well equipped to a very high standard which includes Sky T.V., and for the party lover, it has its own bar. The Villa is surrounded by well maintained mature gardens and is secluded but within easy reach of Cannes (10 minutes), Antibes and is about three kilometres from the Beach and Golf Juan, the best of both worlds. The Villa also has on its grounds a gatehouse where the caretaker/gardener lives and as he is a qualified chef he can take the stress out of cooking by sourcing, preparing, cooking and serving your dinner after a relaxing day by the pool. My experience after spending two weeks at this Villa was "Heaven on Earth"